Platform: Win10+geth1.8.2 I have opened geth to sync block, it's ok to use 'geth attach' directly, but I can't get any return from web3.py. Anyone can help me? Try re-running the code. (If there is some kind of cache clear option in that development environment, use it first). But the web3test.py in your screenshot is only 4 lines long, and doesn't include that line of code. Not the answer you're looking for? Browse other questions tagged solidity go-ethereum web3.py or ask your own question. 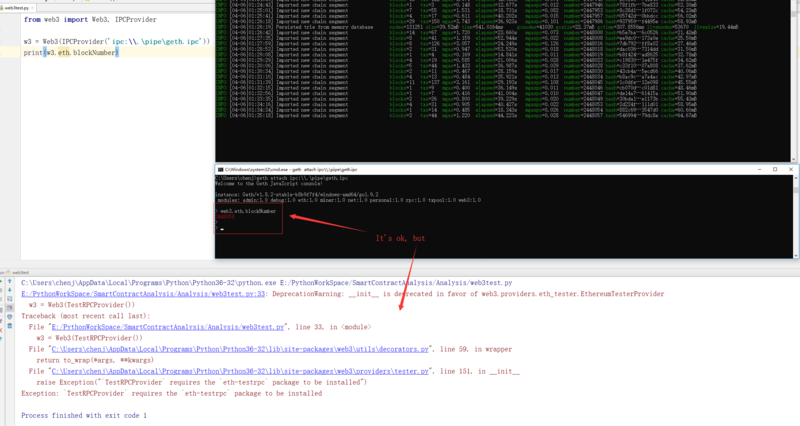 How to get internal transactions from call_tracer results in geth? How make web3 work on? How can i retrieve the stored data from Block chain? How to retrieve data from deployed contract?